Christmas comes early in Cornwall - and Pooh is out! I have a report of total confusion in a Cornwall PO last week. 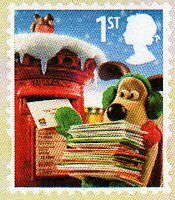 A customer was intending to buy Winnie the Pooh stamps for use on Postcrossing postcards - they had all been sent back but the PO sold her - and she used - Wallace and Gromit Christmas stamps 3 weeks early! Early use is not uncommon but this is very early - if you here of any other early uses please let us know where and when, though the Comment facility below. 2002 Across the Universe mimi sheets in presentation packs were sold a month early from my local post office. I purchased several and used the contents to send early covers to myself and several friends.